The flies have been really bad this summer, both on the beach and in the house. Everyone in Rehoboth it seems has something to say about it be it at a swank birthday party or in a crowded cocktail lounge. Seriously, who hasn’t had to swat away a pest or two this summer? I was talking with one gentleman in the Blue Moon bar who grew up on a dairy farm. While he can still catch a fly with his hand and drown it in a bucket of water, he says he prefers a pink plastic fly swatter. I’ve witnessed guys sitting on the beach at Gordon’s Pond swatting flies on their legs with the yellow plastic ones you get at Quillen’s Hardware. A cheap plastic swatter probably works fine and is undoubtedly easy to clean. But it’s not for me. I personally require something more stylish and masculine when I kill flies. My swatter of choice comes from Finland, an outdoorsy nation knows for its many forests, lakes, and biting flies. Its hand made by a small Finnish company called Tarmoset and constructed with a sturdy shaft made of birch wood, brass grommets, and a “swat” shaped like a fly and made from high quality Italian leather. While it looks and feels good, it doesn’t kill as effectively as it could because there aren’t a lot of holes in the leather “swat.” Flies, you see, can sense the air pressure of a solid object and take off. That’s why fly swatters have holes. Swatters like mine were popular in the 1800s and up until 1900. Before the swatter, people used fans and fly whisks (wooden handles with plant fibers attached). Fancy whisks were made of horse hair. Believe it or not, a fly whisk is cited as the pretext of the French invasion of Ottoman-controlled Algeria in 1830. Seems the Ottoman governor and the French consul were arguing over a debt Algeria owed France for a delivery of wheat. The argument got heated and the governor flicked the Frenchman with his whisk. France subsequently invaded and colonized Algeria. The power of a swat. In 1900, an entrepreneur named Robert R. Montgomery of Decatur, Illinois, patented a device he called the “fly killer.” It was essentially a piece of netting attached to a handle. He sold it to an industrialist named John L. Bennett, who made some minor improvements and kept the name. Shortly thereafter in 1905 a Kansas doctor named Samuel Crumbine attached some netting to a yardstick and called it a “fly swatter,” the name still used today for all sorts of devices designed to kill flies. Have you seen the electric fly swatters? They look like little tennis rackets. Manufacturers claim all you do is press a button, swing it at the fly, and watch the electrocuted insect fall from the sky. No mess to clean up. No agreement either on the effectiveness. Interestingly, not all new swatters are high tech devices or novelty gadgets. Well-known Frenchman Philippe Starck designs deluxe objects and posh condos and hotels around the world. He also takes special delight in rethinking everyday objects like the lemon squeezer, toothbrush, and, yes, the fly swatter. His was produced in 1998 as part of his A di Alessi collection. Made of thermoplastic resin in orange, yellow, pink, green, blue, and black, the seventeen inch tall work of art, according to Starck, stands erect on three feet like a small guardian angel and features a delicate human face on the “swat” to counteract the savagery of the blow. He says he designed it as a far more ecological response to the problem of flies than an insecticide spray. Many museums around the world see Starck as a creative contemporary artist and collect his products as part of their decorative arts collections. Believe it or not, the $16 Starck fly swatter is in the Museum of Modern Art (MOMA). Thank you, Philippe and MOMA, for reminding me of the beauty and the art inherent in the fly swatter. 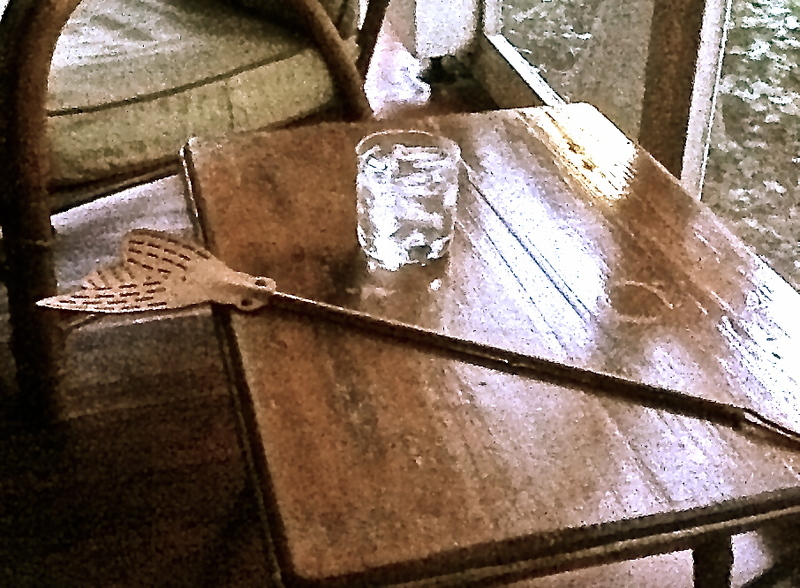 No longer will I feel embarrassed when people comment on the leather fly swatter lying out on a table on the screened porch or when I slap a fly during the middle of a dinner party. It’s not tacky; it’s art.